"This is a dish my grandparents used to make. It is so simple, yet it is so yummy! It is great in the summer and even better with homegrown zucchini." Heat oil in a skillet over medium-high heat; saute zucchini until tender, about 10 minutes. Season zucchini with salt and black pepper. Beat eggs with a fork in a bowl; add water and beat until evenly combined. 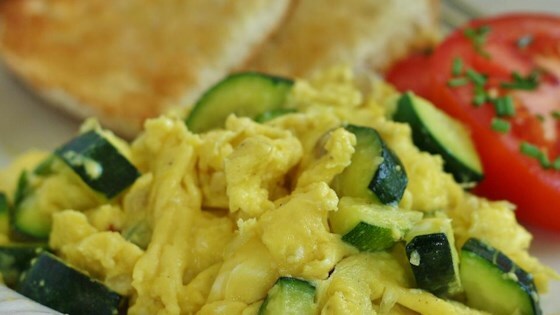 Pour eggs over zucchini; cook and stir until eggs are scrambled and no longer runny, about 5 minutes. Season zucchini and eggs with salt and black pepper. Fried up 1 medium zucchini, then added a chopped tomato and green onion w salt and pepper. Added an egg and some oregano. Nice, especially if I don't want to use cheese. Only change was the addition of a little Parmesan. So good! Great idea. I added about 1/4 of a white onion and 1 clove of garlic. Delicious.